Bothered by bugs? Turn any patio umbrella into an instant Mosquito Net screen house with the Outdoor Umbrella Screen! Tell bugs to buzz off! 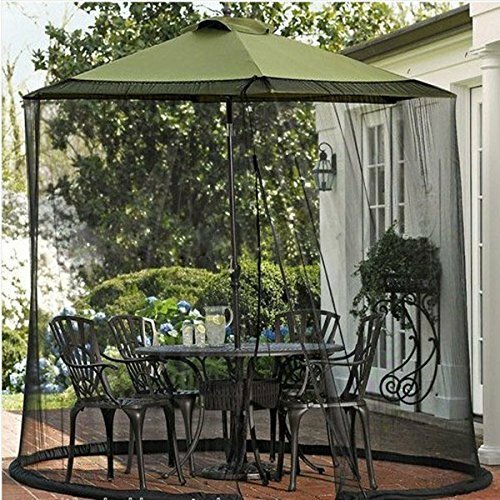 This Outdoor Umbrella Screen Mosquito Net fits like a glove over patio umbrellas . creating a top-to-bottom, gazebo-style, micro-mesh barrier against annoying pests in just seconds. A clever drawstring top makes the height and diameter adjustable for a custom-fit look. Enjoy insect-free evenings for a fraction of what a patio addition or sun room would cost! Net gain: Deploys quickly and easily; Water-weighted ring at base helps create a firm seal; Large zippered entryway; Removes and stores easily when not in use. Use the newest generation of soft water pipe to keep the net in place,so that not swing in the wind and don't worried about the any gap.The pipe is made of high qualty material,which has a better sealing.It can be folded in a litter square for easy to carry. Speed folded,convenient storage.Not only can be used to store,also suitable for travelling.The small size,not occupy a large space,easy to carry.You can enjoy your travelling with your family but don't worry about the mosquito and other insects. If you have any questions about this product by Shatex, contact us by completing and submitting the form below. If you are looking for a specif part number, please include it with your message.